It was a cruel death, really. There was absolutely nothing glamorous about death by crucifixion. Invented by the Persians and perfected by the Romans, crucifixion was not only terribly agonizing but totally humiliating for the victim and his family. The crucified were always displayed at prominent entries to a city as a warning to passers-by that any insubordination to Roman authority could mean a similar fate. Historians tell us that our Lord probably died, not from blood loss, but from asphyxiation. 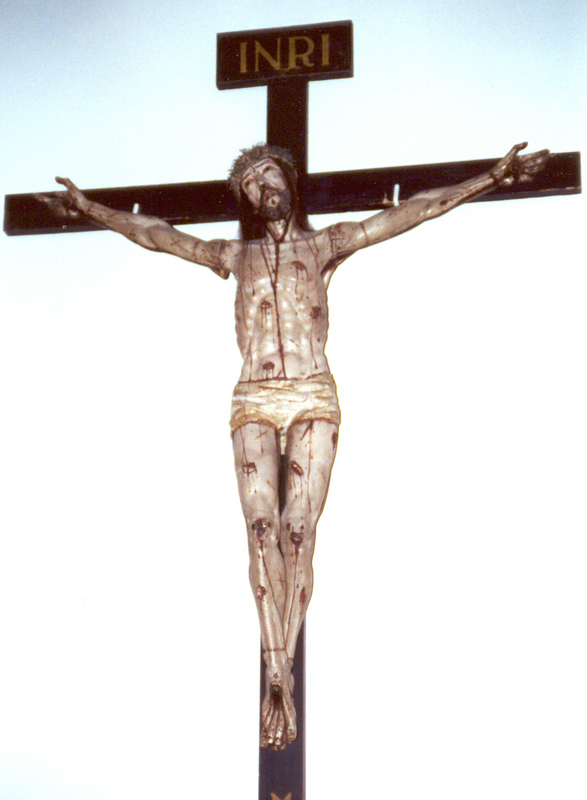 When hung in the crucified position, the victim would have to pull himself up by his arms and by pressing down on his feet to keep his lungs open. Christ's crucifixion was rather unusual because He was nailed to a Cross - most victims were tied to their cross and could languish in utter agony for up to three days, fighting for every breath to stay alive. So our Lord had to pull himself up by his nailed arms and push down on his nailed feet for three hours just to breath. If the Shroud of Turin is in fact authentic, what Christ endured on the Cross should send shudders through our bodies: THIS IS THE DISTANCE HE WAS WILLING TO GO IN ORDER TO REDEEM US! In spite of this physical torture, we know that this paled in comparison with the sense of abandonment that Christ felt in his human nature. More agonizing than the defilement of his body was the sense of feeling totally isolated from the Father. This is why he cries, "My God, my God, why have you abandoned me?" Jesus was not willing to go the distance for us by means of physical torture - he wanted to identify with us in every way that we suffer, including that of feeling a sense of despair and hopelessness. Isn't it our experience that far more painful in life is not the wounded body but the broken heart, the sense of rejection, the emptiness of death, and the loneliness that we each experience. One of the most rewarding ministries that I have encountered as a priest has been my visits to the sick and the dying. You come face to face with suffering - I mean, real anguish. I am amazed at so many of our shut-ins and their loyal caretakers. You see almost instantaneously that the opposite of joy is NOT suffering; the opposite of joy is sorrow - a willed sadness and lack of desire to turn over suffering to God as an offering to Him. I have encountered so many people who find joy in their suffering. They know that they can do so much good by offering their pain to God as a reparation for their sins, the sins of their families, the sins of the world. How closely these persons identify with Christ who learned obedience by what he suffered. Pope John Paul II writes that there is a vocation, a real calling to suffer and these inform and dying people know that full well. I always ask them to pray for me because I know their prayers go straight to heaven. No caller ID - no call waiting - a hotline to heaven, if you will. They know the Cross very well and when they carry it with grace and dignity, you see the tremendous value of their suffering. As Christ hung from the Cross, he was pierced with a lance, releasing water and blood, symbols of Baptism and the Eucharist. This act of brutality unlocks for us the two most fundamental sacraments of the Church: Baptism and the Eucharist. Let us pray for those in our midst who will receive these two sacraments for the first time tomorrow. Christ's wounded side reminds me of a church outside of Madrid, Spain, where you will find a rather unusual altar piece. Atop the altar is a life-size marble statue of Christ lying on his back in the tomb, covered with a shroud. At the torso area, you can see the outline of the tabernacle doors. In order to turn the key which opens the tabernacle doors, the priest must literally reach into the side of Christ. By reaching into the statue's side, the priest unlocks the key to our union with Jesus - the Eucharist. It is a beautiful depiction of how the blood and water that flowed from Jesus on the Cross continues to nourish us as spiritual food. O glorious Cross - what a paradox you continue to be. In you, we see glory in suffering; triumph in desolation. The tree which bore the fruit of Adam and Eve's sin is suddenly replaced with the tree of life and redemption in the Cross. The disobedience of our first parents is reversed by Mary's "yes" at the Annunciation and Christ's obedience unto death at Calvary. Just as Eve was taken from the side of Adam, so too is the Church taken from the pierced side of Christ from which pours out water and blood - symbols of the Church's two most fundamental sacraments: Baptism and Holy Eucharist. O glorious Cross, in your horizontal beam, you teach us to love one another and in your vertical beam, you teach us that we must love God first above all things, above any creature - yes, even ourselves and our loved ones, for it is love for you that guides and directs all other loves. In the end, O glorious Cross, you teach us that love conquers hate, that good conquers evil and that by dying with you, we will be raised to life everlasting. We need to lift up high the Cross more than ever today: in a world ravaged by sin; a world that refuses to accept the suffering of the Cross; a world that fails to recognize that it is in suffering that we actually triumph with Christ. In these uncertain times, we need to raise the Cross and proclaim Jesus Christ and him crucified. 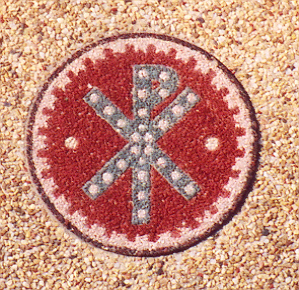 In the year 312, just outside of Rome, Constantine beheld a Cross in the sky and heard an accompanying voice: In hoc signo, vinces! In this sign, conquer! He immediately had his troops paint the Cross on their shields and they went onto win the Battle of the Mulvian Bridge, which led to Constantine's ascent to power and converted the world in the name of Jesus. May each of us, once again, rededicate ourselves to the Cross and zealously proclaim it until it is lifted high for all the world to see. It is my prayer that each of us, from the silence of the Cross, may we hear the Crucified One exclaim, "I love you...I love you...I love you..."
We adore thee, O Christ and we bless thee, because by thy Holy Cross, thou hast redeemed the world!